North Star Air president and CEO Frank Kelner and Marten Falls Chief Bruce Achneepineskum sign a strategic business agreement, which includes a revenue sharing agreement and the introduction of flights between Thunder Bay and Marten Falls beginning on Oct. 16, on Sept. 27 in Thunder Bay. Photo by Rick Garrick. 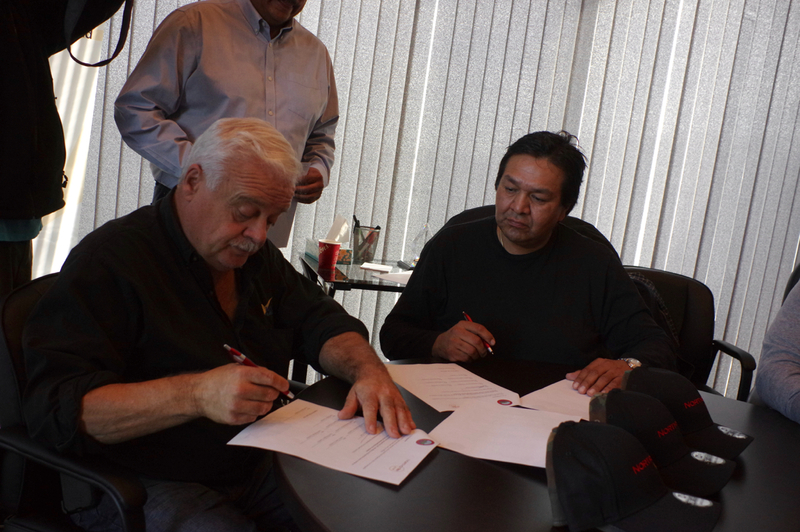 Achneepineskum and North Star Air president and CEO Frank Kelner signed the agreement, which includes a revenue sharing agreement and the introduction of flights between Thunder Bay and Marten Falls beginning on Oct. 16, on Sept. 27 at the North Star Air office building in Thunder Bay. Marten Falls is the eleventh community to sign on with North Star Air, which is a privately held airline that operates a fleet of 15 aircraft providing passenger, charter and cargo services primarily in northwestern Ontario. The other communities are: Bearskin Lake, Cat Lake, Deer Lake, Kashechewan, Neskantaga, North Caribou Lake, North Spirit Lake, Poplar Hill, Sachigo Lake and Webequie. North Star Air brought in an ATR 42-300 two-engine turbo-prop aircraft on a two-month trial basis this past summer for a Flex Flight route from Eabametoong, Neskantaga and Webequie to Thunder Bay. Kelner says North Star Air is currently using a Dash 8 aircraft until it brings in an ATR 72-500 twin-engine turbo-prop regional aircraft in about three-to-four months. Kelner says the ATR 72-500 is a beautiful aircraft. The North West Company purchased North Star Air this past summer for $31 million plus closing expenses. “They (North West Company) allow me to focus on giving better services, not just in freight, but in every environment that we can do for the First Nations,” Kelner says. Achneepineskum says his community is pleased to be working with an established and reliable carrier as air transportation is essential for economic growth and quality of life.